I have been bummed out lately about something that happened five months ago, in March. 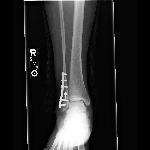 It is a long story about having broken my leg by engaging in a daring feat (getting up to use the bathroom in the middle of the night and turning my ankle) and the surgery that resulted (a stainless steel plate, six screws and a pin) and the recovery time. I am still in that recovery time and I don’t like being slowed down. My family and I lovingly refer to my new, repaired appendage as “Frankenkle”, the healing has gone very well, although not as quick as I’d hoped. Most of the time I don’t even limp, and count myself as a grateful recipient of a divine act. In the grand scope of things, it’s not a big deal…I’m just a little wobbly. Until it hurts– usually after a long day of over-doing it. It swells and aches and makes it difficult to walk. I get frustrated and grumpy. And then I have to be pulled up. I forget that it isn’t a big deal, then when it’s like that. In the momentary pain, I picked opened my bible one day to look for guidance. It opened to the verse in Acts about the man and his instantaneous firm ankle. Funny how God answers our frustrations. Perhaps the idea is that we count ourselves as grateful recipients of the divine even while we are hurting. The most devastatingly crucial act having been Jesus’ undeserved (and very, very painful) death on the cross for my salvation. Sometimes, when I’m in pain because of an injury or a circumstance in my life, I limp around as if I’ve forgotten all of the divineness God pours out on me. Circumstances can be more painful than any other kind of hurt – and just as debilitating! Those are the wobbliest times….a time of trusting the Lord with your family, a time of seemingly unanswered prayer, or not having many nickels to your name. But the promise is the same. My ankle will become firm in time, but my Father is healing more than just my body during this time of slowing-down. When I get bummed out, God reminds me that my faith in him has been made more firm in this slowing-down time, I just have to stand on it to see the millions of things to be grateful for. Are Christians already being persecuted? Oh, Jana; this was the perfect story and insight for me today. I broke my toe on Friday, similar to your happenstance; just packing and ran into the corner of the bed. I’ve been struggling with being still, resting, etc. I hate having to rely on others for help. Have a magazine shoot tomorrow which is a dream come true. I’ve been so absorbed in my pain and inability to prepare the way I’ve wanted. Your post helped me see God’s divine plan and intervention. Time for me to rest, be still, and trust… all very difficult things for me. Love you and so grateful for your gracious wisdom. (((Lisa))) It is the most difficult thing. And I can be physically still for a while – spiritually still is another story! I am so sorry you broke your toe, girl. SO painful! Hang in there and bless others by letting them help you (think of it that way, if it helps 🙂 And congratulations on your shoot – how exciting is THAT!? Keep me posted on the details…I’m so happy for you! Perfect timing! I just found out I’m going to need surgery on my ankle next week. Of course from falling down the stairs; not something cool:) I am struggling personally right now with divorcing my alcoholic husband and all that entails. I know God is in control and wants me to slow down and FEEL this and work thru my emotions. Thank you. Wow – you have a lot on your plate – (((Hugs))). Even as full as it is, God has GOT this 🙂 And yes….slowing down enough to feel what we FEEL is an investment in the future. Feeling have a way of demanding to be attended to, or they fester (sometimes for years!) God bless you, friend.